Eugene Fama is known above all for his asset-pricing model; less well known publicly is that he is also a role model. His asset-pricing model is called the Fama-French five-factor model, and it is his decades-long academic collaborator Kenneth French who paid tribute to his Nobel Prize-winning colleague for the example he has set personally and professionally. Call it behavioral finance of another sort—since the two efficient markets proponents are intellectually at odds with the emerging field that applies psychology to economics. The first lesson French, a professor at Dartmouth, derives from his University of Chicago colleague’s example involves the wise use of one’s time. “Quick feedback enhances a colleague’s productivity and sends a strong signal about the value Gene places on the colleague’s research,” French said of his colleague in remarks archived on Dimensional Fund Advisors’ website. Fama also taught French to stay committed to high standards. This lesson was brought home when French suggested that a marginal candidate receive tenure, comparing the candidate to an already tenured faculty member of lesser productivity. 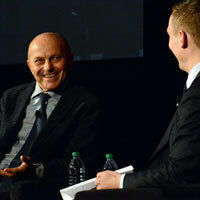 “You make enough mistakes by mistake, don’t make one on purpose,” was Fama’s reply. On another occasion, after the death of a young friend, French commented on both the grief he felt and noted that the shock of his passing at such a young age caused him to reassess his own mortality. Fama’s response—“That’s OK. I saw a 94-year-old yesterday”—taught French the value of making statistically sound inferences. A valuable professional lesson French has learned from his colleague and mentor is that models are just that—schema that simplify the world but which are themselves not reality. “This insight implies that all interesting models are false and that most of the hypotheses people test in finance are also false,” French said in describing an attribute that bolsters his colleague’s empiricism and prevents his getting bogged down in theory. Aiding this approach to economic modeling is Fama’s strong emphasis on keeping things simple. “When writing papers, he works hard to make his logical arguments and statistical tests as simple as possible,” French said. Another hallmark of Fama’s professionalism, and empiricism, that French describes is his command of the data. The University of Chicago professor will actually memorize the key data emerging from an empirical test. Indeed, when deciding whether to commit time to reading another text, he will evaluate its worthiness by first examining its tables. Fama’s mastery of the data is so great that “he can describe the evidence from ancillary tests we did 25 years ago. After five decades of study, Gene knows more about financial data than Google,” he quips. For mere mortals lacking this ability to memorize facts, French recommends an effort to master broader rules of thumb, for example that the U.S. equity premium from 1926 to 2013 has been roughly 8% and annual volatility 20%. Another characteristic of Fama’s scholarship is the attention he pays to clarity, brevity and precision in his writing. While he emphasizes all three, he will sacrifice the first two if necessary to ensure the third. The University of Chicago professor may revise a paper five or even 10 times prior to publication, in recognition of the fact that few colleagues will ever read a paper more than once. Fama also eschews footnotes, believing that if a point is sufficiently important it belongs in the text and if it is not that important, it should not be allowed to derail the reader’s train of thought. Returning to matters of personal conduct that impinge greatly on one’s professional life, French notes his colleague’s collegiality as vital to fostering the exchange of ideas. “In other areas of economics, intellectual disagreements often lead to personal animosity. This rarely happens in finance,” said French, noting Fama’s friendship with his University of Chicago antipode, behavioral finance exponent Richard Thaler. Indeed, on one occasion where French made a hiring recommendation—this time with high academic standards firmly in mind—Fama “said hiring him would be a mistake because he does not treat his colleagues with respect” and would thus undermine the academic environment. Fama’s commitment to ideas has led to concomitant refusal to engage in ad hominem argumentation. “He consistently focuses on the idea he is arguing about, not the person he is arguing with. For example, he says a reporter’s question doesn’t make sense, not that the reporter is a pompous, arrogant fool,” French related. Fama’s approach in such situations is to give his critics the benefit of the doubt, assuming they are acting in good faith, and presuming—initially, at least— that his critics are correct. The thrust of all these lessons is that one can learn as much or more by a great person’s personal conduct as the intellectual content of his ideas.